Chair cover in ivory, $4 per cover, DIY. Sash not included. 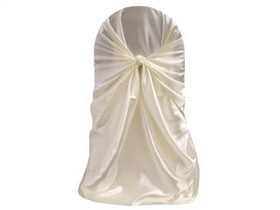 Description:Soft satin wrap in Ivory for your banquet chairs. Set-up and tear down also available in the lower mainland for $6 per cover.